Boston Impressions by Richard Nowitz. 80 pages, 9 1/8'' x 8 1/8'', 132 color photos, softcover, Smythe-sewn. ISBN 10: 1-56037-437-3; ISBN 13: 978/1-56037-437-4. Nowitz presents 132 full-color photographs of this bustling harbor city that helped launch the United States of America. 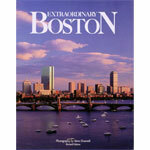 The beautiful images convey Boston's unmistakable cityscapes, large and small, as well as the surrounding harbor. Nowitz's photographs convey clear impressions of distinct neighborhoods, public spaces, and fabulous architecture found throughout the city. Festively lit downtown streetscapes are counterbalanced by tranquil harbor scenes. Stunning sunrises share the pages with rich interiors of historic buildings. Photos of throngs of happy, celebrating Bostonians are offset by close-ups of the serene greenery found in a quiet nature preserve. 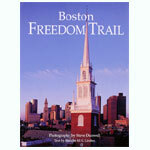 Informative captions complement the photographs, providing enough detail that even casual readers will learn something of Boston's fascinating history and contemporary culture. Richard Nowitz's photographs regularly appear in the world's leading travel guides and magazines. He has more than twenty-five large-format photo books to his credit. Nowitz has been a contract photographer with National Geographic World, Traveler and Book Division. His photograph of camels at Giza was selected as the logo for the National Geographic TV News Channel. His photos are syndicated worldwide through the Corbis and National Geographic Image Collection.